When we as Christians consider the coming of Christ and the rise of Christianity, we tend to focus on the spiritual forces at work – the powerful preaching of the gospel, the apostles’ martyrdom for the faith, and the evangelistic attraction of the early church’s common life together. 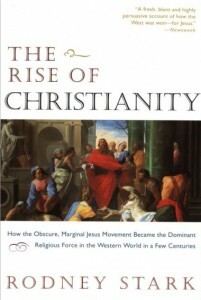 A book like The Rise of Christianity: How the Obscure, Marginal Jesus Movement Became the Dominant Religious Force in the Western World in a Few Centuries (New York: Harper One, 1996) by Rodney Stark may seem unusual at first, as it traces the sociological factors in the rise of Christian belief and practice. Today, I’m going to summarize the case Stark makes for the rise of Christianity and then tomorrow, I’ll offer some points of application for our churches. Rodney Stark wisely begins his book by acknowledging the helpfulness and also the limitations of social science. “No sacrilege is entailed in the search to understand human actions in human terms. Moreover, I do not reduce the rise of Christianity to purely ‘material’ or social factors” (4). Nowhere is Stark seeking to deny the Christian belief that God was at work in the beginning of the Christian movement. Instead, he wants to examine the means by which this rapid growth occurred. He believes social science will put an end to some of the common, persistent myths about Christianity’s rapid growth. For example, examining the constant rate of growth of Christian believers, Stark questions the often-assumed link between Constantine’s conversion and the Roman Empire having a Christian majority. “Constantine’s conversion would better be seen as a response to the massive exponential wave in progress, not as its cause” (10). Why Does a Religious Movement Grow? So what factors are at play in the rapid rise of a religious movement? There are certain social dynamics that must be examined. Networks of family and friends play a huge role in conversion. Stark sees conversion as being more likely when “people have or develop stronger attachments to members of the group than they have to nonmembers” (18). Stark also notes that “new religious movements mainly draw their converts from the ranks of the religiously inactive and discontented, and those affiliated with the most accommodated (worldly) religious communities” (19). The implication of this migration from one religious affiliation to another is that the middle and privileged classes are more inclined to convert than the lowest classes. “New religions must always make their way in the market openings left them by weaknesses in the conventional religion(s) of a society,” Stark writes, and “religious skepticism is most prevalent among the more privileged” (37). Why is this the case? Stark believes the class of people most likely to understand the new religion and see the need for its beliefs will be the most economically privileged (39). Stark’s sociological study of the rise of early Christianity would be incomplete without an in depth treatment of the relationship between Judaism and the early church. Rather than seeing the relationship as inherently hostile, Stark makes the case for an intertwined Jewish and Christian identity, as large numbers of Jews converted to Christianity from the first to the fifth centuries (49). To make this case, Stark spends an entire chapter sketching the reasons why scholars have assumed a low rate of conversion among faithful Jews. Then, in light of new sociological findings, Stark counters the conventional wisdom and makes the case that large numbers did indeed convert peacefully. Another role in the burgeoning Christian movement was played by social crises, brought in the wake of disastrous plagues or in the common chaos of urban life. During the early centuries of Christian growth, a series of natural disasters (including earthquakes and epidemics) disrupted the Roman Empire. Stark believes “Christianity offered a much more satisfactory account of why these terrible times had fallen upon humanity, and it projected a hopeful, even enthusiastic, portrait of the future” (74). These explanations helped Christians cope with the disasters, which in turn helped Christians survive at higher rates than pagans. Furthermore, the massive numbers of those who died disrupted the normal social bonds that would have attached people to their families and neighbors. Because Christians were more likely to survive the plagues, pagans found new friendships with Christians whose faith would have been appealing in the midst of such turmoil (75). Stark also points out the chaos associated with urban living during this period of history. Life in the city was one of disease, misery and fear, providing Christians with the opportunity not only to imagine a better world in the distant future but also solutions for present-day problems (149). Another factor in the rise of early Christianity centers on the role of women in the early church. Because of Christianity’s prohibition of infanticide and abortion, Christian families were more likely to raise up daughters in the faith. High rates of intermarriage between Christian women and pagan men brought about “secondary” conversions to Christianity, not to mention the likelihood of children being brought up in the church (95). Christian historians often point to the testimony of the martyrs as a major reason for the rise of Christianity. Stark does not discount the role of martyrdom, but he puts it into perspective. For example, he counters the irrationalist vision of martyrdom that sees persecuted people as clinging so tightly to their personal faith they make irrational choices that lead to their demise. Stark believes the martyrs saw their sacrifice as the best choice, given their belief in the rewards they would gain in return (167). Likewise, “martyrs are the most credible exponents of the value of a religion, and this is especially true if there is a voluntary aspect to their martyrdom” (174). But Stark also counters the common Christian perspective by showing how the number of martyrs was never very large, and the persecutions that took place broke out intermittently and never focused on all Christians everywhere. Tomorrow, I’ll offer some points of application for today’s church. Right now, I’m curious as to which of these contributions to the rise of early Christianity surprises you. Do you agree or disagree with Stark’s analysis?